Asiatische Märkte, wasserspeiende Hydranten und kultige Festivals — Einwohner von New York City erzählen von ihren liebsten Sommererlebnissen. Summertime, and it’s sunny and hot (often way (ifml. )hier: allzu, viel zuway too hot) in New York, a city that is ready to show you its fun-loving, relaxed side. 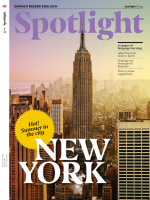 Read on for fascinating personal tips on what to enjoy in the Big Apple, courtesy of sb.mit freundlicher Genehmigung jmds. ; hier: dank jmdm.courtesy of a musician, a party promoterOrganisator(in)promoter, and a kids’ magazine editor — three perspectives from people who know and love the “city that never sleeps.” Get out your notepad or your iPad: you’ll want to copy down a few of these ideas if you are going to NYC now, or for your next summer trip to the Big Apple. I grew up in San Diego, California, and I came here for graduate schoolGraduiertenfakultät, Hochschule für Aufbaustudiengraduate school in music in 2008. Even before I moved here, whenever I would visit New York, it would feel like home. I think the one thing New Yorkers have in common with each other is that, in general, most people are from elsewhere — even native New Yorkers are mostly only one generation native — and most people are ambitious about something. That to make for sth.für etw. sorgen, zu etw. führenmakes for a group of very interesting people to call your neighbors. I love New York in the summer! I’ve spent many summers in New York, and what’s strikingauffallend, bemerkenswertstriking is that no one wants to be inside their apartment. Air conditioning is expensive, and it’s miserably stuffyschwül, muffigstuffy. Also, things slow down just a little. People have a bit more free time, and they are out late because the best weather is at two in the morning. So most of the time, everyone is out of doors, just enjoying the city. One of my favorite things to do is to take rides on the ferry — not the Circle Line cruises for tourists, just the regular New York city ferry. It’s part of the Metropolitan Transportation Authority (MTA) system, so it costs about $2.75, and it’s one of the best ways to get around — particularly from downtown Manhattan to Brooklyn and parts of Queens. And they have beer on tapvom Fasson tap. You get great views of the city skyline and feel the breeze off the water. I think it was former mayor Mike Bloomberg who once famously said that when he was a young, poor 20-something, his go-to date night was the Staten Island Ferry with a six-pack of beer. There are always free outdoor movies, too. Bryant Park has one every weekend. Another cool place is Socrates Park in Long Island City, Queens, that has some pretty artsy (N. Am., ifml. )künstlerischartsy movies. They’ll to screenvorführenscreen French new wave and film noir. Parks are also great for free concerts. There are Tuesday-night concerts at the Naumburg Bandshell in Central Park. I’ll be playing in several this year. And the New York Philharmonic has free concerts in parks all across the city. The Metropolitan Opera shows filmed operas for free on a giant screen in front of Lincoln Center plaza. For anyone visiting the city, I’d say: make sure to go to many different neighborhoods. The most interesting parts of New York are not near Times Square. Within Manhattan, Greenwich Village and Chelsea are definitely worth seeing. Further out, Flushing in Queens is great to visit. It has a huge Chinatown, bigger than the older one in Manhattan, and it’s as close to East Asia as you get in New York. In Brooklyn, Greenpoint is a very interesting neighborhood. It’s an old Polish neighborhood that still has a strong Polish presence, with Polish restaurants and groceries, plus a younger crowd of artists in their thirties who live there. Further south, in Brooklyn, Sunset Park has a very large community of Mexicans and Chinese immigrants, as well as some of the best Mexican and Chinese food in the city. Sunset Park itself is gorgeousumwerfend, herrlichgorgeous, of course, and if you climb to the top of the hill, you can see the sun set behind the New York skyline and Statue of Liberty. Wherever you go, the 24-hour subway allows you to go out whenever you want and always know there’s a cheap way home, even if it involves waiting for a while in a muggymuffig, stickigmuggy station. But the airconditioned subway cars are an oasis and a great way to cool off. I grew up in Canarsie, Brooklyn, and I’ve lived in Astoria, which is Queens, Staten Island, and Crown Heights, also Brooklyn. I’ve never lived in any other state. When I was a kid, in the summer, we would go to Coney Island a lot, and I still go there often. Over the years, I have had friends who do burlesqueVarieté, Burleskeburlesque, and a lot of them are in the Coney Island Side Show. It has circus people, magicians, snake charmerSchlangenbeschwörer(in)snake charmers — a friend of mine many years ago became the snake charmer. There’s a guy covered from head to toe in tattoos, contortionistSchlangenmenschcontortionists who bend their body in crazy shapes. And on weekend nights, there are fireworks, and then they do free movie nights on the beach, which is really fun. There’s also the yearly Mermaid Parade, where everyone gets dressed up in homemade mermaid costumes. I never go, because I always have to work that weekend. Another place I’ve loved to go to since I was a kid is the Cloisters in Upper Manhattan. In a lot of ways, it’s the opposite of Coney Island. It’s a museum that’s part of the Metropolitan Museum of Art, and it’s basically a rebuilt castle, made out of medieval monastery(Mönchs-)Klostermonasteries and abbeyAbteiabbeys that were to take apartauseinandernehmen, zerlegentaken apart in Europe and shipped here to be put back together. It’s set in the middle of Fort Tryon Park, which is just a giant park, lushüppig, saftiglush and green. You can have a picnic outside in the park, and then go see these beautiful medieval artifactKunstgegenstandartifacts and tapestryWandteppichtapestries. They have the famous unicornEinhorn-unicorn tapestries there that mean a lot to me, and I’m always really moved by seeing them. It’s very quiet and cool and calm, and you feel like you’re not even in the city. Further out, it’s an easy day trip to go to Storm King Art Center, this outdoor sculpture gallery an hour north of the city by train. It’s 500 acreMorgen (4.047 m2)acres and full of these amazing sculptures by artists like Andy Goldsworthy and Alexander Calder. Some of them incorporate the landscape in some way, and there’s the landscape of the Berkshires in the background. Closer in, another quick trip is City Island in the Bronx. It’s part of the city, but it’s a little spit of landLandzungespit of land that sticks out into Long Island Sound. It’s a small fishing community with a lot of antique shops and seafood restaurants. When I was a kid, we used to go there to get seafood meals and just to to hang out (ifml. )rumhängenhang out. It’s a really unique part of New York City. Here in Brooklyn, there are always a lot of events I go to every summer. My friends throw a big dragqueen festival called Bushwig in Bushwick that my wife and I never miss. It’s two days long, and open to the public. You can go in costume, or not go in costume: It’s up to you. They schedule two days of all kinds of performances. Hundreds of people come, and it’s really fun. A lot of times, it’s held outside, or at least there’s an outdoor portion, so you can take advantage of the nice weather. Another festival we always love to go to is Afropunk, which is this really incredible weekend of food and culture and musical performances for and by black and brown folks — mostly cultures from the African diaspora. We also go to PS1. They have outdoor parties during the day with DJs and a dance party and food vendorVerkäufer(in)vendors. It was the first public school in Queens, and it houses contemporary art. There are lots of different installations that are set up in the space, and it changes periodically. They have a book fairBuchmessebook fair as well which is really cool. Also in Queens is the Queens Night Market, which is set up like an Asian night market, where you can have all these different kinds of food. If you like eating, which I do, you would want to hit that as well as Smorgasburg, a food market [in Williamsburg on Saturdays and Sundays] at Prospect Park in Brooklyn. You can get all kinds of food: Mexican, Korean, Chinese, Japanese. There’s a place that just does waffles, a place that just does breakfast foods, another that just sells things on a stick, like sausages. I really like food. The thing about living in New York is that there are always free or cheap things to do — every day, every time, inside and outside. You could travel here and spend barelykaumbarely any money on food. You could have a great meal for five buck (N. Am., ifml.)Dollarbucks. And the nice thing about New York is that you can just walk around and create your own food tour. Hit a neighborhood or pick a train stop. New York is huge, and you can have a great time literallybuchstäblichliterally doing nothing, just walking around with no goal or no aim. Just stop at a store and to grabschnappengrab a quick meal and take it to the park somewhere. I was born in the Bronx, and I’ve lived in Harlem for 14 years. I was a really bookish kid, so most of my childhood memories of summer in New York are of me in my room, reading. But now that I’m an adult, I’m an amateur photographer, and in the summer, when the weather is nice, I like to walk around the city and explore different neighborhoods, and find hidden places in the city to photograph that you might not know are there. For example, recently, I went to visit the Little Red Lighthouse. It’s underneath the George Washington Bridge. It was built in 1883, before the bridge existed. It helped guide bargeFrachtkahn, Schleppkahnbarges up and down the Hudson River. In order to get there, you have to go to 181st Street, then walk toward the river, cross this pedestrian bridge, and then head down through this woodedbewaldetwooded area in Fort Washington Park. When you finally see it, it’s this cool little nookEcke, Schlupfwinkelnook of the city, and you feel like: “Wow! This has been here the whole time, and I never knew about it.” You’re looking up into the gutsEingeweideguts of the bridge, and it’s a way of seeing the city that’s unusual and fresh. My advice is: Wear good sneakers. You will want to walk if you come here, even as a tourist. I to run across sth.etw. durch Zufall findenrun across cool things like that all the time. Sometimes I go looking for some landmark I’ve read about; other times I just to stumble on sth.unerwartet über etw. stolpernstumble on things. Once I was looking for cherry blossomBlüteblossoms, so I headed to the park on 124th Street. There weren’t any cherry blossoms — it might have been the wrong time for them — but I ran into Grant’s tombGrabmalTomb instead [in Riverside Park, at Riverside Drive and W. 122nd Street]. There’s no admission. You just go inside and learn about Ulysses S. Grant [who was a Civil War general as well as being, from 1869 to 1877, the 18th president of the United States]. For visitors, my advice is: Wear good sneakers. You will want to walk if you come here, even as a tourist. Walking is the best way to experience the city, and sometimes you can walk somewhere during rush hour faster than a cabTaxicab could get you there. And being on foot allows you really to experience the ambienceAtmosphäre, Stimmungambience of regular day-to-day summer life in the city. Usually in the summer, especially in the uptownin den Wohngebietenuptown neighborhoods, people will break open the fire hydrants in the parks or on the street. If it’s warm out, I’m sure a fire hydrant’s open somewhere uptown. The fire department doesn’t seem to mind. It’s too hot for people to care really. That’s one way folks keep cool, but there are also cartWagencarts on the street that sell icees — shaved iceRasureisshaved ice with flavored syrup out of square metal coolers. If you have an icee, it will change your life. There’s usually a lady on the corner. They’re never stationaryortsfest, stationärstationary. They’re always walking somewhere, and you have to chase them or do a circle around the block. I’m always looking for the icee lady, or the Mister Softee trucks that sell soft-serve ice cream. They’re everywhere in the city. I know it’s summer when I’ve officially had a vanilla coneEishörnchencone with sprinklesStreuselsprinkles.